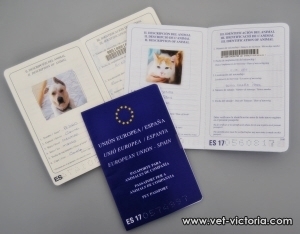 European Passport: This Passport, is similar in every country of Europe, and is writte in the language of the country of origin and also in English. For some Countries, ( UK, Ireland, Malta, Sweden, Norway, Finland..) is also necessary to do a worming treatment before the entry. We can help you with the paper-forms and stamps. Is recommended to check with your Vet what vaccine to do before the trips, as the medicins to prevent bites; because are insects that can transmit several illnes to your Pet. Your dog or cat vomit during the trip?. This problem can be treated with tablets to stop this bad feeling, just ask us!